It was a great delight and pleasure to meet Clodagh Reid – Singer and Actor from Ireland. I was asked to create gorgeous theatrical, feathered headpiece for her upcoming Annie Lennox tribute show. We collaborated together really well and both enjoyed the process of creating the headpiece. 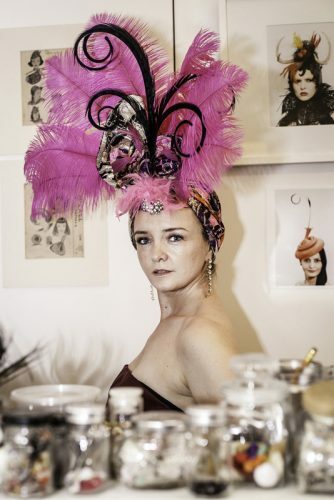 Enjoy the photos, the exotic pink headpiece and her biography! Clodagh Reid is a Singer & Actor from Ireland. Graduating with honors degree in Music from Maynooth NUI in Ireland 1999. Clodagh’s combined passion for music and the theatre led her to study with Deirdre O’Connell at Ireland’s famous Stanislavski studio ‘Focus Theatre’ and also with Patrick Sutton at The Gaiety School of Acting. 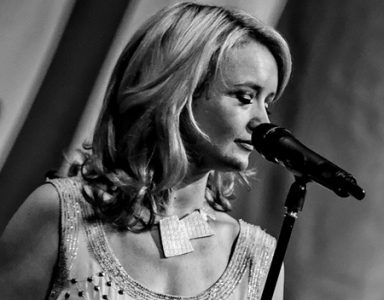 Prior to Australia Clodagh worked as a singer and performed and recorded with internationally acclaimed Celtic group Anúna (1999 – 2002). As an actor Clodagh appeared in many T.V Advertisements & Film roles, most notably Michael Collins, The Last of the High Kings, ‘The Clinic’ (IFTA) Custards last stand up (BAFTA) ‘8.5 hours’ which premiered at Cannes Film Festival in 2009 to name but a few. Clodagh also starred in her own woman show ‘Life Shop Till You drop’ with Wonderland productions (2007 – 2010) which toured throughout Ireland, UK & UAE. Clodagh moved to Australia in January 2011 in the same month joined and commenced performing with the Sydney Philharmonic choir at the Opera House.